As can somewhat be seen in the picture here, I was fortunate enough to find one of my grail Harley Quinn items on one of my recent trips out and about. 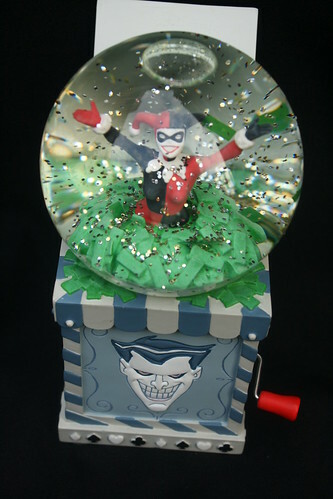 I remembered seeing the Harley Quinn snow globe on a previous trip to the Outer Limits but that was well almost a year ago, I wasn’t surprised when I couldn’t find it. I was kind of disappointed but I found some other Joker toys and a few comics and was on my way to the door when I saw the snow globe’s box on a high shelf. It was fetched down for me and needless to say I bought it. Why was this so hard to find, you ask? Harley Quinn is pretty popular so her stuff tends to send out pretty damn quick and this particular item was released in November of 2001. 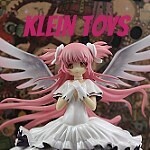 The snow globe is almost ten years old, my chances of finding on the shelf anywhere at MSRP were next to nil I was extremely fortunate to find her. 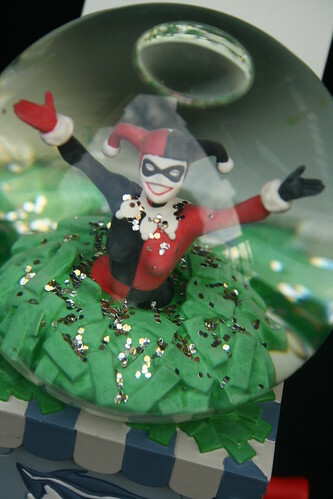 There actually two other snow globes in this line: Joker and Batman but Harley Quinn was my favorite and I am quite happy just having her. Harley Quinn also has the added gimmick of playing music if you turn the crank the song “we’re in the money” plays but unlike normal music boxes it actually requires you to keep on turning the crank to make music. This entry was posted in Comics, Love that Joker. Bookmark the permalink.